Ginger and Scallion Beef Stir-fry - Tender, juicy, and super delicious recipe that's better than Chinatown. Make it yourself quick and easy at home. Recently I bought some wagyu beef from the market. I used some of the meat to make the ponzu and miso butter steak, and the leftover, I made them into Chinese ginger and scallion beef, which is one of my favorite Chinese beef stir-fry. 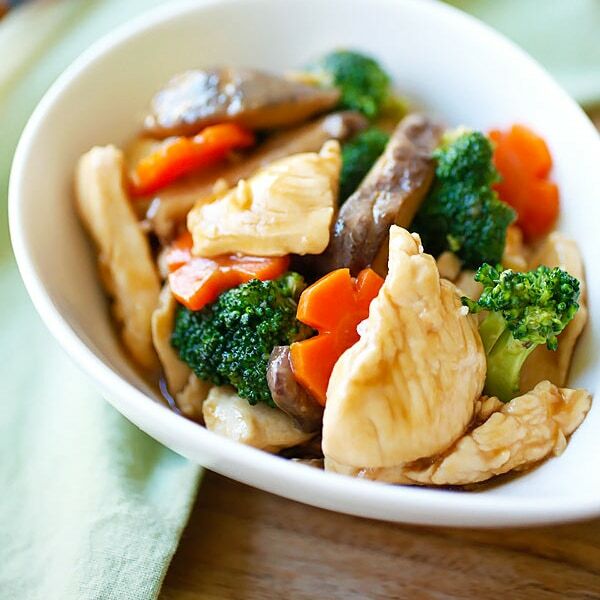 This stir-fry is one of the very first Chinese recipes I learned when I first started cooking. Fresh ginger and scallion makes for the best recipes. For example: ginger and scallion chicken and ginger and scallion crab. I love the light oyster-based sauce and a dose of wok hei (breath of wok), which makes the dish so delicious and appetizing. Just thinking of pairing this ginger and scallion beef with soft, fluffy steamed rice fresh off the rice cooker is making me hungry. 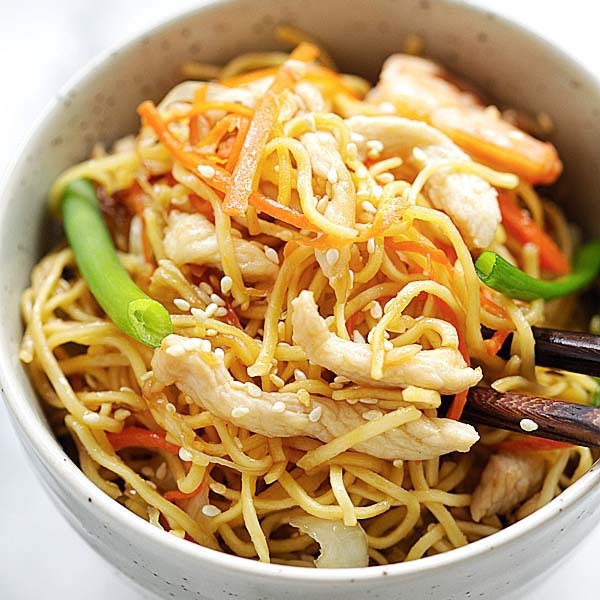 I hope you enjoy this simple and humble dish, which is great for busy moms and perfect as weekday dinner for the entire family as it takes just 15 minutes to prepare this wonderful dish. 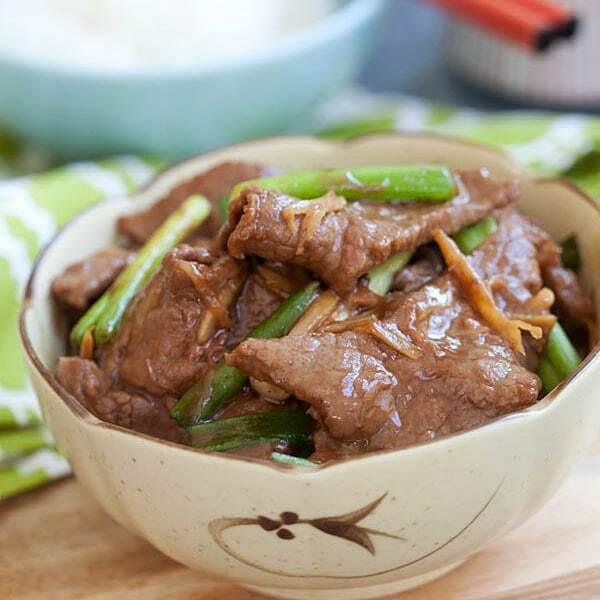 Ginger and Scallion Beef – Tender, juicy, and super delicious ginger and scallion beef recipe. Make ginger and scallion beef at home with simple ingredients and 15 minutes. Marinate sliced beef with the cornstarch for 10 minutes. Combine all the Sauce ingredients, mix well and set aside. In a wok, heat up the oil until very high heat, stir-fry shredded ginger until fragrant. Toss in beef slices and continue to stir-fry for a few minutes, or until beef is cooked. Add in the Sauce and stir-fry a couple of times or until the sauce thickens. All scallions, stir dish out and serve with steamed rice. So enjoying your recipes as always . . . I will definitely try this recipe, however, I cannot eat MSG, or sugar. I will try to come up with an alternative to the ingredients that contain MSG, and sugar. This is always a problem for me when I prepare Asian recipes. I usually make my own sauces so I can eliminate MSG, and sugar. I use extra garlic, onion, ginger, turmeric, soy sauce with no added MSG, Splenda, and in some cases a little extra Sea Salt. Low-sodium, gluten-free soy with loads of ginger, scallions, some sea salt and Splenda is a splendid idea to a great ginger and scallion beef stir-fry! Try replacing sugar with Honey or Stevia. Hi Bee! I bought your cookbook and spent all day Saturday cooking. It was fabulous! What a treasure your book is! Thank you for sharing! Hi Maggie, thank you for your continuous support! I am here if you need any assistance. Happy cooking! I just made your beef with brocoli tonight and my boys couldn’t get enough of it. I just have a question, I went to a Korean market to buy the beef and they had a beautifully sliced boneless short rib that had a nice marbling ,can I buy that instead of flank ?I bought flank tonight and I sometimes find it a bit tough. Thank you and love your cookbook . Yes, you sure can. If the boneless short rib are thinly sliced, make sure you cook them under 5 minutes, and not marinate the meat more than 5 minutes. Otherwise, water from meat might leak out to the marinade and meat might turns out bit tough and dry. Bee, this looks mighty delicious. I often order this dish in nonya restaurant (Chinese dish section) in KL. Now I can make it at home. Thanks for sharing. This is one of the first wok recipes I learned by a taiwanese lady in Australia. However her cooking technique was slightly different, it’s still the same dish. I will post the recipe i learnt from this dish after my trip to Kuala Lumpur:). Mmm, I imagine the wagyu beef beeing extremely tender and delicious to work with. Wagyu beef…. sounds really delicious. It is luxurious food even here in Tokyo. I have never tried it but can imagine the taste. 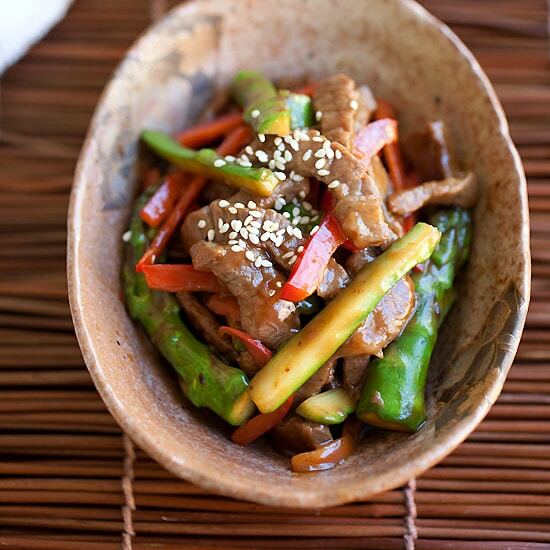 :-) Stir fry beef with light seasoning, this is the recipe I have been looking for. Thanks. Bee, your Beef & Ginger recipe is out of this world! My husband, Sebastian is still raving about it! I love it too! I just love your website & so does hubby! Many thanks! Look forward to trying recipes in your cookbook that i just purchased! Can I substitute mirin for Shaoxing wine? I can’t find the Shaoxing in my area! No, you can use cooking sake or just skip it. So tasty. The beef didn’t have as much color as yours but still tasted good. I suspect the heat wasn’t high enough. Can you buy Maggi seasoning in a grocery store and if not what can you substitute in its place? This looks amazing..as do all of your recipes! :) Just wondering though, when do I add the scallions? Can’t seem to find it in the recipe. Also, Im from Toronto, Ontario in Canada and have been having a hard time finding some ingredients. You wouldn’t happen to know of any places that sell Asian spices or sauces that ship to Canada at reasonable shipping rates, would you? I know it’s a long shot but no harm in asking, right? In any case, thanks again for the wonderful recipes and for the help! can we omit sesame oil? Love your site! But it would be nice if you didn’t have to click through each link to get to the recipe page…! Hi Chantal thanks for your comment. My website has been built this way since its inception 10 years ago, but I appreciate it your honest feedback. Easy and delicious. Occasionally I substitute onions for the scallions. The result is also delicious. Thanks for this recipe. Thanks for trying my ginger and scallion beef recipe.